This is the fourth paper in the category, 100 Papers You Should Read (in vision science). This was important in attempting to define how light was captured and transduced into signals that could then be processed by the neural retina and perceived as color. Everyone *knew* that there must be a pigment in the retina as Boll back in 1876 described the effect of light on the isolated frog retina that caused the light pink color to fade (photobleaching). Later work by Kühne in 1878 described the regeneration of the pink pigment in the dark and also isolating it to the outer segments of rod photoreceptors. The real trick now, was trying to figure out how color vision was encoded and Young’s theory of color vision in 1802 was the way. Young proposed a model that perception of color could be encoded by three principal color receptors rather than thousands of color receptors coding for individual colors. This paper, Visual Pigments of Single Goldfish Cones by W.B. 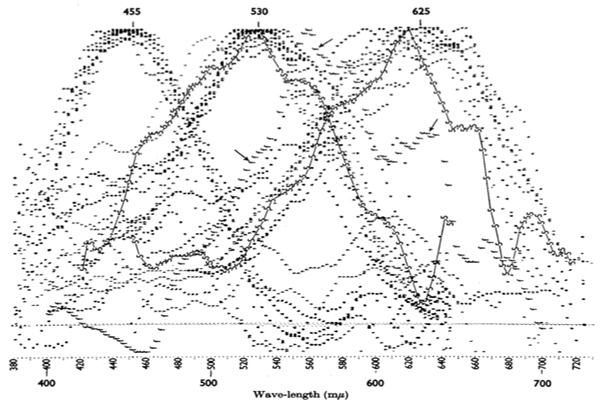 Marks was work derived from his doctoral dissertation in the laboratory of Edward F. MacNichol, Jr. where he described in isolated retina, three different classes of cones, each with a differing pigment which was then used to compare human and non-human primate values in later work. This paper described the first definitive measurement in history of any visual pigment in the outer segments of cones. These quantitative measurements were an effort to get at the “truth” that William Rushton spoke about. As an aside, the other always impressive thing about early research in the visual system was the clarity of logic and thought and especially the resourcefulness of the investigators who for this study, built their own microspectrophotometer. Spectrophotometers were invented back in 1940, some 25 years prior to this study, but they were 1) *very* expensive and 2) not entirely suitable for work of this kind as the need to image biological samples was not possible with the then commercially available, Beckman DU Spectrophotometer.